The Great War radically changed women’s role in society, as they stepped into the boots of men gone to fight for their countries. In cities across Europe, women took on traditionally “male” jobs – waiting on tables, delivering the mail, teaching in boys’ schools or handling cash as bank clerks. 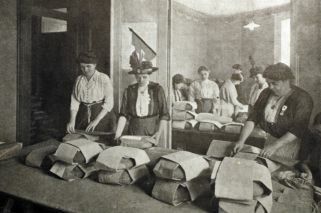 From 1915 onwards, Europe’s industry – devoted to the war effort – relied massively on the female workforce, as did that of the United States from 1917. “Without women, victory will tarry,” warned Britain’s soonto-be prime minister David Lloyd George in 1915. Some 400,000 women were toiling in France’s war factories by 1918 – a quarter of the workforce – handling some 2,500 shells per exhausting 11-hour shift. The contribution of women is also widely held to have helped secure them the vote, as early as November 1918 in both Britain and Germany, and in 1920 in the United States. Up until the outbreak of war, feminists on both sides had pledged themselves to peace in a kind of transnational women’s solidarity, explains historian Joshua Goldstein. But within months all the major feminist groups had thrown their weight behind their respective governments, predicting that patriotism would enhance the p r o s p e c t s f o r women’s suffrage, he said. Women contributed mostly on the home front, but more than 80,000 also served in Britain’s Women’s Army Auxiliary Corps as nurses, mechanics, cooks or ambulance drivers. An emblematic few were exposed to the danger of war, as soldiers – or spies. “It is a queer side of war to see young, pretty English girls in khaki and thick boots, coming in from the trenches, where they have been picking up wounded men within a hundred yards of the enemy’s lines, and carrying them away on stretchers... I lift my hat to you!” she said. The most famous were the “Battalion of Death” – several hundred women soldiers led by a 25-year-old peasant girl named Maria Boshkareva, who set up the battalion with permission from the tsar.